Britain's defending champion Christine Ohuruogu qualifies for the women's 400m semi-finals at the World Athletics Championships in Beijing. 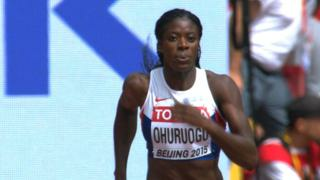 Returning to the stadium in which she became Olympic champion in 2008, Ohuruogu won her heat impressively in a time of 51.01 seconds. Fellow Briton Anyika Onuora also qualified for the semis as a fastest loser after running a personal best time of 51.14secs to finish fourth in her heat.